Check Out the Oswald Chambers Collection! Over a century ago, Oswald Chambers captured the heart of God in his teachings, and his straightforward yet profound wisdom continues to challenge and encourage minds today. Although he is best known for the classic devotional My Utmost for His Highest, all of his writings speak straight to the heart, exploring the depths of our humanity and our profound need for a God-focused life. Today, the collection of his works features more than thirty products, including several editions of My Utmost for His Highest, topical books and devotionals, calendars, journals, and more. 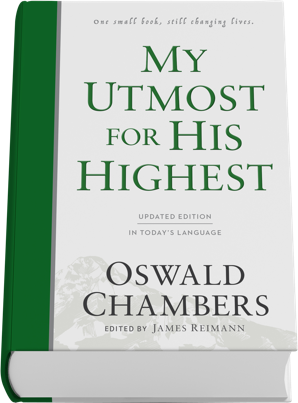 Download the My Utmost for His Highest app. Read daily inspiration from My Utmost For His Highest in the edition of your choice. Join the conversation on each day's reading. Set reading reminders. Stay current with the latest news and updates from My Utmost. Read the original text in Oswald’s own words. Contemporary language that stays true to the wisdom and insights of the original text.